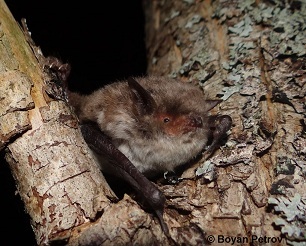 The Long-fingered bat is medium-sized and has a wingspan of 230 - 260 mm. It is a grey-coloured bat, with medium-sized ears, noticeably hairy legs and large, strong feet. This species enjoys mild continental habitats and cave-rich limestone areas. It can also be present in other habitats if underground sites are available. A cave-dweller, M. capaccinii roosts in caves and mines throughout the whole year. It is known to hibernate in small groups in western Europe and in larger colonies in the East (often shared with Rhinolophids and Miniopterus). The Long-fingered bat is a trawler, which means it circles and takes its prey (e.g. flies, fish, water boatmen, moths) from water surfaces. Considered a short to middle range migrant, travelling 40 - 50 km between summer and winter roosts. 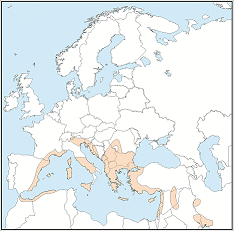 Sparsely distributed around the Mediterranean coasts. Can also be found in eastern Turkey across Syria, Lebanon, Israel, as well as Iran, Iraq and Uzbekistan. Due to its diet, changes in water quality (e.g. through pollution) and loss of water bodies can be considered threats to M. capaccinii. Roost disturbance through tourism and fires may also be problematic for the species.